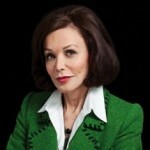 Barbara Joan Estelle Amiel, Baroness Black of Crossharbour is a British-Canadian journalist, writer, and socialite. She is also the wife of former media baron and convicted felon Conrad Black. Amiel was born into a Jewish family in Watford, Hertfordshire, England. Her parents divorced when she was eight, after her father, Harold, left her mother for another woman. While in England, Amiel attended North London Collegiate School in Canons Park, Edgware, Greater London, an independent girls' school founded by Frances Mary Buss in 1850. Family difficulties including some financial hardship during the early years in Canada, precipitated her living independently for periods of time during her adolescence during which she held a variety of jobs to support herself. In 1959, she entered the University of Toronto, where she attended University College and took an honours degree in Philosophy and English. Amiel was an active communist, and was a delegate in 1962 to the Soviet-organised World Festival of Youth and Students in Helsinki, Finland.